Years ago I swore I would never go camping. “I’m not going to pee in the woods!” I declared. And then a friend of mine convinced me to try camping at a KOA when we couldn’t find a hotel for our trip. Wow! I couldn’t believe camping included hot showers, real toilets, and a shop to buy snacks! Obviously not all camping locations have the same amenities, so you need to do your research before heading out, but the thing that stuck with me about camping is how much planning and packing is necessary! As a homeschooling family, I feel it’s important to get out in nature, explore areas that are unfamiliar to us, and as a one-income family, the cost savings helps our vacation dollars stretch further. Even if you’re not the outdoorsy type, I do think that a camping trip, tent and all, is a great experience for a family to work together and build memories. Some state DNRs even have programs where you can borrow basic camping equipment if you’re new to camping. Now after camping with between 1 and 4 kids over the last 12 years, I’ve found a few camping tips to reduce the work in planning, and ideas to smooth over rough spots in a typical camping trip so we can get the most benefit and have great memories when all is said and done. If you’re going on a multi-day camping trip, bring frozen solid meat for the second or third night. Bonus: double bag it in a ziploc bag with marinade. It’ll act as an ice cube for the first day and a half and be ready by the end of day 2. Pack scrambled eggs with milk and any seasoning in a closed jar with a tight lid for breakfast for day one. A good hearty breakfast is a great way to start your trip and get everyone started on the right foot. Use a bag of ice in your cooler rather than loose ice so your food isn’t swimming in water. Don’t over pack. You can wear an outfit for two days. Just bring clean underwear for each day. Also, everyone can use the all-in-one soap/shampoo/conditioner that’s marketed to kids for a couple days. Simplify whenever you can. Pack snacks. Lots of snacks so your helpers are not hangry. If you’re not opposed to it, bring melatonin to help the little kids fall asleep at night. Goodness knows air mattresses look like trampolines at night. If you’ve never gone camping before, start out with one night. Anyone can handle one night. Don’t over plan your day. One activity a day can be plenty. Camp near a site you’d like to visit, like a historical fort, or a cave that offers tours. Check out the hiking trails before you book your trip. Many places have trails with picnic spots along the way. Start to pack up your things right away when you wake up on the last day. Packing up always takes longer than unpacking. Try to arrive two or more hours before dinner time, otherwise you might be eating in the dark. It can take a while to set things up. Keep a bin with your camping gear (plates, utensils, kettle, napkins, sticks for s’mores, soap, bug spray, etc.) packed at all times and stored away between trips. You’ll have less to pack, and you’re less likely to forget something. About half the things on the below list are already packed in our camping bin. It’s tempting to just bring food with that you can eat cold, but some of the kids’ favorite memories are of cooking over the fire. It’s such a novelty to them to cook over an open fire. One of my daughters was only 3 when we stayed just two nights and I swear she remembers everything we ate, even now 4 years later! 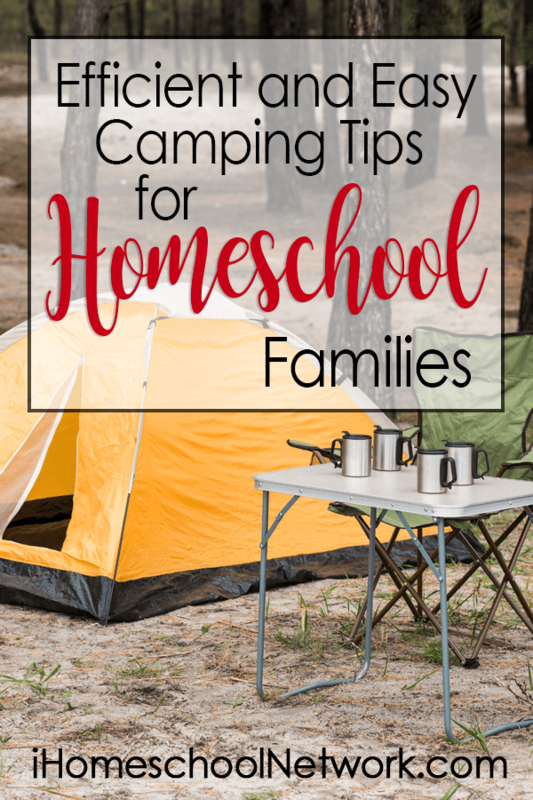 Camping does require some forethought, but as homeschoolers, it’s easy to wrap in many subjects into a trip and make the most of out it. Some great camping sites are right near major historic landmarks or amazing geographic sites. I hope the tips above make your trip easier for you, and make camping more accessible if it seemed like too much work before! Do you have any easy camping tips to share?